Mid-January finds me in recovery from non-stop holiday cooking and post-partying depression, yearning for my husband to surprise me with tickets to an all-inclusive, white sand paradise where the kitchen is hidden behind a towering arrangement of tropical fruits, and Kahlua and Irish whiskey find a place next to the espresso machine at the breakfast buffet. That’s an unlikely scenario, so I’m working my way out of the kitchen doldrums, bent upon injecting sizzling fun into my frost-laced reality. And pulling out the pizza stone and peel is a great start. Working and stretching dough is therapeutic, my inner child finds pizza creation an amusing sport, while the buried artist is unleashed imagining pizza dough my canvas and the toppings paint. Tuning Pandora to Puccini is an added touch; why not insert passion into the process. 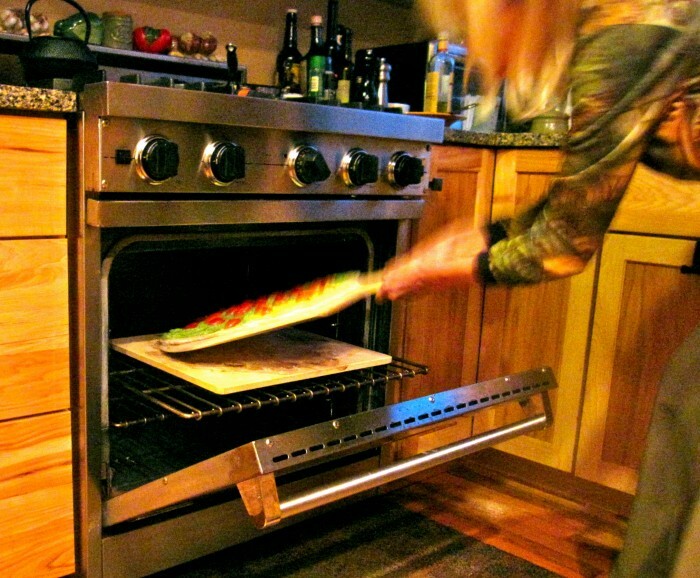 Pizza making techniques vary considerably, and when I grill pizza it’s an altogether different game; the following method is for an oven-baked pizza. I make no promises this recipe is the absolute, but I’ve made pizza this way for years and it invariably yields a crispy pie without too much fuss. After dough rests 20 minutes or so, I pull and work into desired shape. You could make your pizza dough from scratch, and on-line recipes abound, but I don’t bother — there are a couple of Michigan-made frozen pizza dough options to be found at area groceries. Tisios is a favorite, but for the recipe below, I selected a larger frozen dough ball, Cardillo, from Hiller’s that also yields a crisp and chewy crust with a slight undertone of fermentation. You could also use a heavy cooking sheet, preferably without sides, and a couple of spatulas as the tools to make your pizza, but make no mistake: For the best homemade pizza, invest in a pizza stone and a pizza peel. The best pizza stones will distribute the heat evenly across the base and extract moisture from the dough, increasing the likelihood of a crispy crust. Many make their own pizza stone using a slap of terra cotta, but make double-dog sure it’s unglazed — glazed stones contain lead, an ingredient you do not want to add to your pizza. Pizza stones also come in various sizes; I recommend selecting the largest stone you can find. Cornmeal acts as roller enabling pizza to slide from my peel to the hot stone. Whenever you use a pizza stone, place it in a cold oven, then preheat your oven to the desired temperature. (I, personally, never make pizza in ovens less than 400 degrees or greater than 475.) Be forewarned that if you place a cold pizza stone into a hot oven, it could break. And, like a well-seasoned cast-iron skillet, do not wash your stone with detergent as it will seep into the pores. Let your stone cool to room temperature, then rinse with warm water scraping residual pizza off with a knife. Over time, when properly cared for, your pizza stone should develop a patina encouraging a non-stick surface. A conundrum for novice pizza makers is getting the pizza from the cutting board or counter onto and off the hot pizza stone. There are various techniques to insure a smooth operation, and for me the two necessary tools are a wooden pizza peel (the approximate size of a tennis racket) and cornmeal. Here’s how it works: After stretching and resting my dough on a floured cutting board or cold counter top, I transfer the dough to the pizza peel, which has been dusted with cornmeal. Then, after “building” my pizza on the peel; the cornmeal acts like tiny rollers allowing my pizza to slide from the peel onto the hot stone. Pretty cool. My toppings in the following recipe are suggestions — check out the menus of your favorite pizzerias and consider using their ideas as a springboard, keeping in mind some of the best pizzas are made simply with a smear of good tomato sauce, fresh mozzarella and basil. Place oven rack in the center of oven. Place pizza stone, lightly dusted with corn meal, in cold oven; preheat oven to 425 degrees. Place thawed dough on a pizza peel that has been lightly dusted with cornmeal; pull edges of dough out slightly and let dough rest 20 minutes, or according to package instructions. While dough is resting, blend ricotta, garlic, and arugula in a food processor. Place Asiago in processor and pulse until just combined. 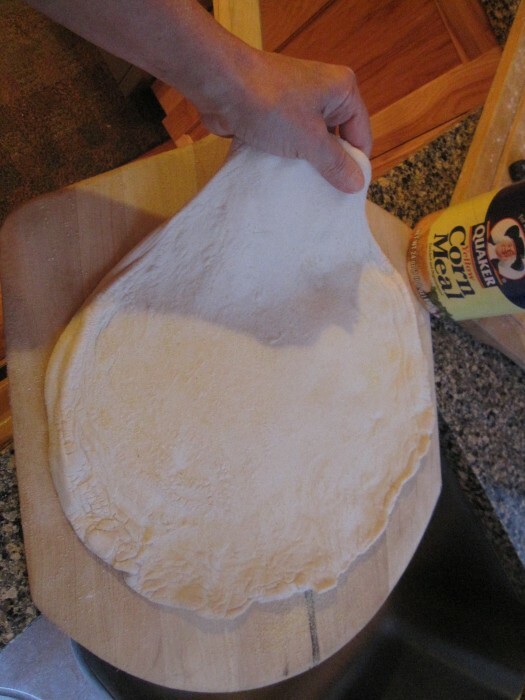 Stretch dough into a large 10-12 inch oval, circle or rectangle. ( I prefer a a thin crust, so stretch it thin.) Lightly brush olive oil on top of pizza dough. Lightly season dough with freshly ground sea salt or kosher salt. Spread ricotta mixture over dough, leaving 1/2-inch edge around the circumference bare, and sprinkle Asiago along the edges. 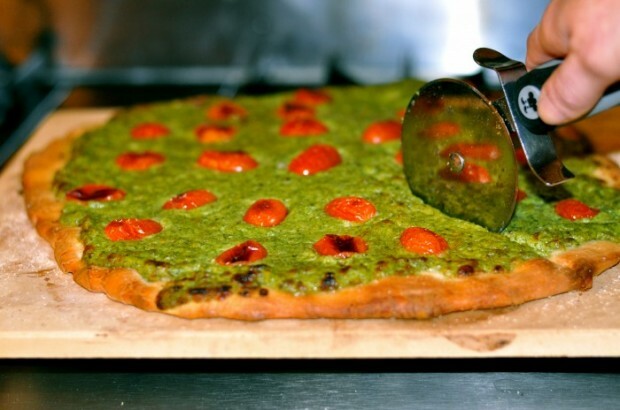 Decorate pizza with grape tomato halves. Carefully slide pizza from pizza peel onto hot pizza stone and bake pizza until crust is golden brown, about 15 minutes. Turn off oven. Carefully remove stone from oven or slide pizza from stone onto peel. Let cool a couple of minutes, slice into wedges and serve. More Recipes Filed Under "Pizza"